I'm starting to run out of books on my wishlist for this series! Quick! Recommend me some books! 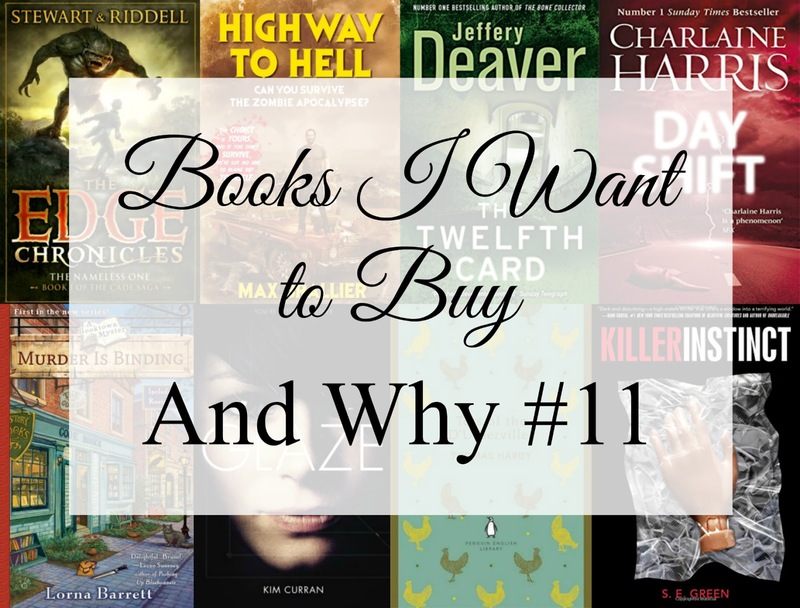 It's time for Books I Want to Buy and Why #11, the series where I show you eight books I want to buy, and tell you why I want to buy them. Last week I talked about the authors who make up the majority of my collection and Chris Riddell & Paul Stewart made the list with their Muddle Earth books and The Edge Chronicles. I've been wanting to re-read and actually finish this series for a while now because I never completed it as a kid, and I have some gaps in the series. This fills one of them! A couple of years ago my christmas present from my brother was themed around zombies, there was a Rick Grimes action figure and Max Bralliers first book; Can You Survive the Zombie Apocalypse? It's an interactive book where you make choices and see where it gets you. I love it. So, obviously, when I found out a companion book was coming out- you bet it joined the list. Another book that was added when I was organising my most owned authors post, I want to read the Lincoln Rhyme series in it's entirety and to do that- kinda need the sixth book that I either never had or has been lost to the book stealing storage unit. I'll probably wait until I actually start my read of the series to buy it though. This is the second book in Charlaine Harris's new trilogy, the first book actually featured in Books I Want to Buy and Why #6 and then I got it for Christmas. But I've been holding of reading it because I'm not great at waiting for new books so I'm waiting closer to the release of book three, Night Shift, which isn't out in paperback until next year although the hardcover is out already I think. Damn my need for series to match. Either way, I want Day Shift. This is the first book in a cosy crime series set on a street of book stores! The main character sets up her own mystery book store, she's living the dream. Except for all the murder. I love reading about reading, it's one of the reasons I'm in the book blogging community, and I love cosy crime so this is right up my alley. This is a YA Dystopian book surrounding social media. And I had been watching a lot of Black Mirror when I found it so I added it to my wishlist and kind of forgot about it until I made this list! It still really peaks my interest though. We're at a time where social media is evolving so fast. I remember thinking Instagram would never take off. It promises to be an interesting read and it's been a while since I read any YA. As a kid, I read a book that had the main character talking to someone about this book. I can't remember what the book was, but I always remembered that conversation. I don't know much else about it, but I've never read anything by Hardy before and c'mon- the Penguin English Library cover. A couple weeks back I was browsing Sarah's blog after meeting her down in London at the Pierce Brown event at Hachette, and came across her review for Killer Instinct. It is one of my goals to write a review where the person immediately needs a book, because Sarah nailed it. I was on Amazon in a second and adding it to the list! What's on your wish list? Have you read any of these books?